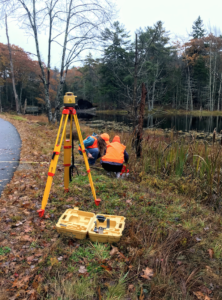 Each year, since Fall 2015, groups of civil and environmental engineering seniors from the University of New Hampshire have been evaluating culverts along roads on Georgetown. The culverts evaluated are selected by the Road Commissioner, Charlie Collins. The students collect data on the culverts’ size, materials, condition, and elevation relative to the road. 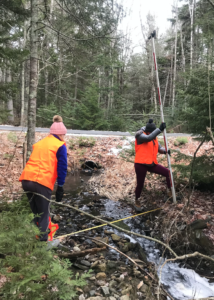 The size of the watershed served by each culvert is also determined using a new map the students produced in 2018 using the latest information available from the State of Maine’s GIS database. Each culvert’s ability to pass the 2, 10, 25, 50 and 100 year storms is estimated. (A 2 year storm has a probability of 1 in 2 or 50% of occurring in any given year. Likewise, a 100 year storm has a probability of 1 in 100 or 1% of occurring in any given year.) This information, along with photographs, is placed in the Road Commissioner’s database to help the Town prioritize culvert maintenance and repair. As of Fall 2018, approximately 90 culverts had been evaluated. When properly functioning, culverts allow precipitation runoff to pass under roads, minimizing flooding or washout potential. Culvert characteristics that make a difference include material, shape, end/edge type, geometry, inlet/outlet elevations, downstream slope and tailwater cross-section profile. Tidal effects complicate the picture with two-dimensional water flow. During 2019, the students hope to work with volunteers from Georgetown to collect data about whether certain culverts, estimated to fail at the 2 year storm, actually do flood the road. Volunteers will be asked to go to a given culvert at a time during the daylight of their convenience, after a rain gauge at their home contains a certain amount of rainfall. 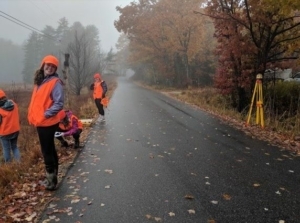 The volunteer will take photographs, from a pre-established vantage point, of the road (and any flooding) and a wooden color-coded elevation stake installed at the site. (The volunteers will not be asked to go into the water.) The photos will be uploaded to an internet storage site and will be used by the students, along with the rainfall amount and duration, to determine the validity of the culvert failure estimates. Volunteers will be trained, provided with the rain gauges and given a protocol to follow. Culverts selected for observation are located along Indian Point Rd., Five Islands Rd. east of Seguinland Rd., and in the vicinity of Robinhood Rd. With sea level rise, the team is also looking to add effects of spring high tides in certain areas.